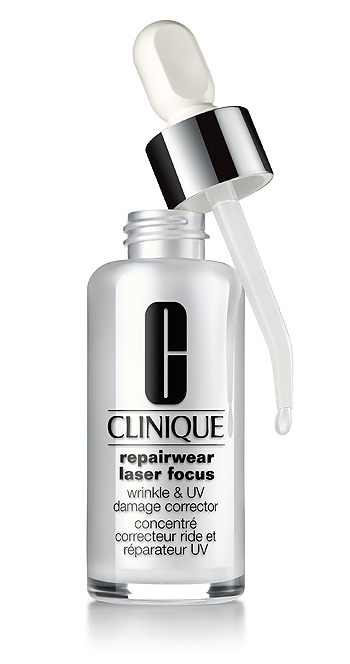 … or to give it’s full title – Clinique Repairwear Laser Focus Wrinkle & UV Damage Corrector! Brand new from Clinique, this is sure to be a top seller this Autumn/Winter… especially with Christmas round the corner. Promising to combat both wrinkles and UV damage, could this be the all-in-one solution that so many desire? 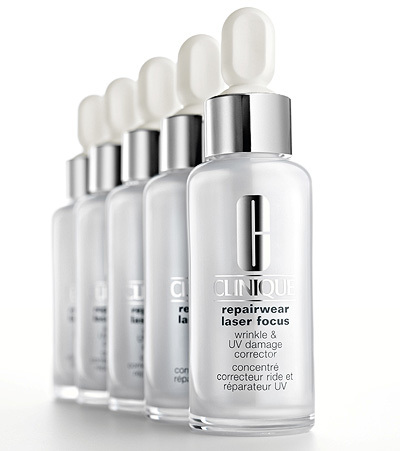 Clinique introduces NEW Repairwear Laser Focus Wrinkle & UV Damage Corrector, a de-ageing serum uniquely formulated to work day and night to reduce the appearance of lines and wrinkles, and repair and help prevent UV damage with results remarkably close to a dermatological laser treatment. Use just three drops of NEW Repairwear Laser Focus Wrinkle & UV Damage Corrector twice a day and in 12 weeks, achieve 63% of the visible wrinkle reducing power of a laser. Like three serums in one, delivering multiple benefits leading to visible wrinkle reducing results of a laser. Skin might not forget, but it can now help forgive the visible effects of sun, stress and pollution. I’ve been sent one for review consideration. I’ve seen some pretty impressive results with it on other blogs, but in all honesty… I don’t think a review from me would do this much justice. At 29, I don’t have wrinkles or even many fine lines… wait, let’s interject a little more honesty in that statement. At 29 and with a penchant for cream cakes… I don’t have wrinkles or even many fine lines. It’s the cakes, not the genetics. I’ve also never been one to accept and review products “just ‘cos I can”, so I’d like to offer this up to one of my lovely readers to trial thoroughly and review honestly for my readers. There are a few ‘stipulations’ though. * Your trial period is 12 weeks with one reader update (no photos required) around the 6 week mark and a reader conclusion (with photos) once the trial period is over. If you fit the above criteria and fancy giving this a go, please leave me a comment below and I’ll choose someone suitable next week. My mum is 58 years old and would be delighted to try this product but is this available only in UK? I’m from Italy.. I am 38 and have wrinkles around the eyes that would be the perfect tester for this product. I looooove Clinique. oooooooooh! Volunteering myself please…..am turning 40 next year and am filled with dread and horror. I can see fine lines and wrinkles widening by the day to become massive canyons (I am possibly every so slightly prone to over exaggeration…). But seriously, I have watched myself age 20 odd years, since the birth of my son 7 years ago and am on a mission to find the fountain of youth – failing that, would love to try this product! Can we volunteer mothers? If so, sign my one right on up! If mum’s are in I’ll volunteer mine! She’s been wanting to get i on the action with my blog for some time. She’s over 50 and takes good care of her skin, so she’ll definately give it the best chance of working! She would definately love to give a new product a test run! I would like to put myself forward for the clinique trial. I am 37 and gave up a heavy smoking habit last year but also am miss stressy so have lots of frown lines so plenty of room for improvement ! I’d love to review this product for you. I just turned 37, am a mom of 2. I have more pigmentation issues than actual wrinkles. I’m also a licensed esthetician (although not currently employed as one) and I’ve tried nearly every product under the sun (no pun intended) so I think I can give a good review and opinion of this product. I’ve also used Clinique Even Better spot correcter so I can compare it to that as well. Let me know, thanks! My first thought was my mum, but I wasn’t sure if that would be ok, but considering everyone else is doing the same, I will put my mum forward. She is 50 and has done a review on my blog before. She would love to try something like this & she could never afford to try it ordinarily. I’d love to give this a go – I am a 46 year old mum of 2 and wear contact lenses which does mean I am more prone to fine lines/wrinkles around the delicate eye area. Anything that helps reduce/repair the ravages of time would be more than welcome – as I am not quite ready to turn into my mother just yet! I’m 41 and spent the first 20 years of my life in New Zealand where there is virtually no ozone layer – resulting in noticeable wrinkles and lines around my eyes. I try to take much better care of my skin now, and would be keen to test Clinique’s Repairwear and provide feedback. My mum has asked if I will volunteer her. (She does read your blog but is VERY busy, she’s a child social work, whilst at uni and cooking dinner right now..). She turns 40 in January and really isn’t looking forward to it. She’s raised us three kids and unfortunately we’ve ravaged her skin! She suffers from severe redness at times, and her wrinkles really get her down. Even though I think she is so beautiful. She’s more than happy to have her photos uploaded and shared. Oh no! I just bought it yesterday!! Would it be great if I had won? Greetings from across the pond. I would love to volunteer as the guest blogger. I think it would be a perfect match since I clearly need to use this – or a similar product, am a huge fan of your blog, and am renowned for speaking my mind (not sure if that’s a compliment, but I see it as one). I’m about to turn 37 and have fine lines under my eyes. I would like to say they’re from smiling, but it’s more likely that they’ve developed as a side effect from giving people the stink eye. My 10 month old son is delightful, but his birth left me with some lingering melasma on my cheeks. I’ve used ROC to no avail, as it is too harsh for me and leaves me red and peeling. And while not the biggest fan of Clinique, I’m willing to go into the experiment with an open mind. Thanks for your consideration! Could you tell us what blogs have reviews of this product? I’d love to read some reviews! I am always searching for a good product to plump up fine lines. I am only 27 but have fine lines under my eyes that drive me crazy. wish I could volunteer for the review but I’m not 35 :-(. but I’d love to read lots of reviews of this to see if it is for me! I would love to review this! I’m 33 and have sun damage above my upper lip (on only one side to boot!) as well as fine wrinkles around my mouth and on the outer corners of my eyes. I got so excited when I saw your inquiry for a guest reviewer…can this be the solution to get rid of the brown line/wrinkly look around my mouth!!????? I have damaged the skin on my cheeks really badly from sunbed abuse and have dark sun spots. I would love to see if this product makes any difference and lightens the marks as nothing else has worked! I’d love to review this, although it means I have to fess up to my age to do so (ummm, 41, she mumbles!). The lines under the eyes just wont disappear, no matter what I do, so if there’s something out there that stops me having to photoshop all my photos before I show them to anyone , then I’d love to try and review it for you and your readers. Hi, I would be thrilled to participate. I am 63 and weary of my wrinkles and saggy skin. Hope this product will save me. Please consider me. I am looking for a product that will help the vertical lines around my lips and just give my 48 year old skin a boost. opportunity to be a reviewer. This sounds just like the product my mum needs as she has lots of lines on her face and wants to make them less visible. I would love to take part! I’m nearly 45 and would love to test this product. Happy to produce “before and after” photographs and will strive to give honest, focussed feedback.